At a certain point one has earned enough miles and hotel points that cash becomes an attractive option. After perusing many cash back credit cards, I came across the SunTrust Cash Rewards Credit Card, which seems like a pretty good cash back earning card, especially since it has no annual fee. Depending on your relationship with SunTrust you could earn a whopping 10.5% cash back if you take advantage of the current 5% bonus offer for gas and grocery purchases! While this is not an exciting card with crazy category bonuses, 5% on gas and grocery purchases is a very generous offer. If you max out the $6,000 limit within the first year, you can expect to earn $300, which is not too shabby. Granted there are cards with higher cash back earning rates on gas, but if you’ve maxed out those cards, or if you have a banking relationship with SunTrust, then this offer might be particularly attractive to you. Now, if that sounds good, later in my review I’ll tell you how you can earn even more than 5% back if you are an existing SunTrust customer. It may be possible to earn even more than 5% with this offer. For one, some people have been targeted with a 6% offer. I personally have received multiple mailings recently advertising 6% cash back on the first $6K in spend on groceries and gas. If you deposit the rewards into a SunTrust account you can earn a bonus of 10%, 25%, 50%, or 75% depending on what type of account you have. Details on redemption options and bonuses can be found here. While most people reading this blog are not sitting on $100K in their checking account, nor are they wealthy enough to qualify as a Private Wealth Management customer, however if you do, you would end up earning a whopping 10.5% cash back if you max out the $6,000 spend bonus. If you have a Premier Banking account, or even a SunTrust Signature account, then a 25% or even 50% bonus can increase your earnings rate substantially. For instance, let’s assume you earned the maximum $300 on the initial bonus, if you get an additional 50%, your earnings would be $450. That equates to an earning rate of 7.5%! Even just a 25% bump would get you $375 equating to 6.25% cash back. 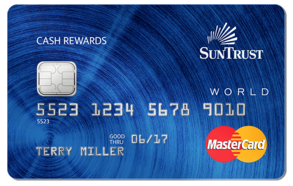 My SunTrust Cash Rewards Credit Card review shows that while this card is not the sexist of cash back cards, it comes with a nice sign up offer worth $300 or more, and has a hidden bonus kicker if you have a banking relationship with SunTrust. Of course existing SunTrust customers would find this offer pretty attractive, but others who are interested in the 5% bonus period may be interested in this card as well. 2 Responses to "SunTrust Cash Rewards Card Review"